The longest race that I have ever run was 10 miles and took place several years ago. I was in better shape back then. The route went through both woods and a suburb. Crowds of people cheered me on—people that I didn’t know. Periodically I’d come upon a small band playing music or a couple of middle-aged women doing cheers with pom poms. What a celebration! It took a lot of training to be able to run that distance, and much of my training took place with a running group. I was one of the slower runners in the running group and I ran a shorter loop than our runners training for a marathon. They ran eight or ten miles as if it was nothing, and many of them did this before heading off to work. On the weekends, they did their long runs. I’d see them after they had run 15 or 20 miles. Sometimes they had run that distance with blisters. They came back tired and they’d stretch their sore legs, propping them way up the side of a gazebo. They would go home and take ice baths to ease the pain. They would see chiropractors and sports doctors to help them get over injuries. And they’d be running again in a day or two. I have always had a deep respect for anyone who runs and completes a marathon. My sister and I would watch our friends run the Chicago marathon. We went early enough to see the elite runners come through around the halfway point. Then we’d cheer for all the runners while waiting for our friends to pass. We rang bells and we carried signs and balloons hoping our friends would spot us. Tens of thousands of people run the Chicago Marathon and it is hard to spot an individual runner. After we’d seen our friends (or realized we’d missed some of them), we took the cross streets to get to the finish line so we could see as many friends as possible cross the line. 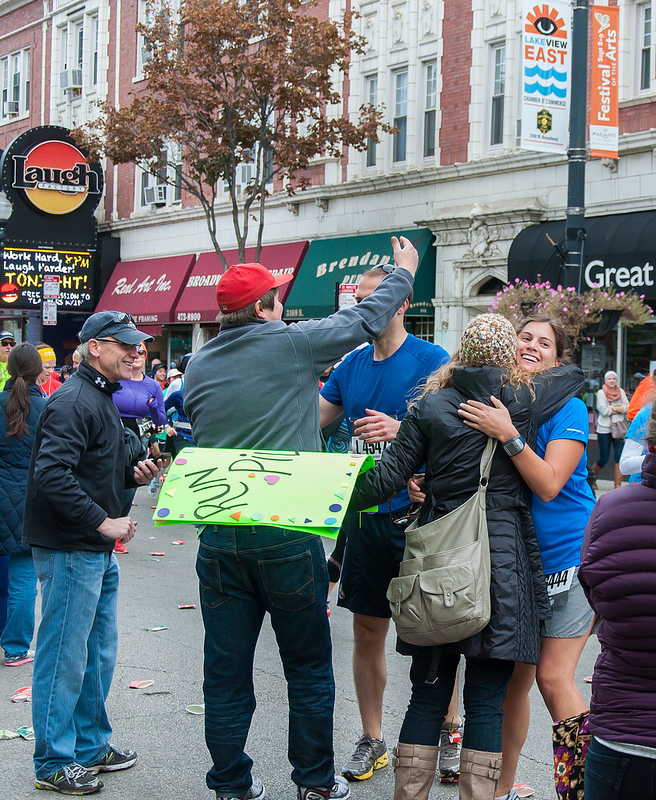 We were giddy with delight when a friend or relative crossed the finish line. By this time, we were hoarse from cheering but we and the other spectators kept yelling and ringing bells. I’d heard about the Boston Marathon from members of the running group. You can only run Boston if you meet a qualifying time for your age group in another marathon. Some of my friends would train especially hard for the Chicago Marathon, making every effort to qualify for Boston. Those who ran the Boston Marathon told of the many spectators cheering them on. When passing Wellesley College, the students would be cheering with extra enthusiasm. Then there was Heartbreak Hill – a very steep hill near mile 20. That is about the time many runners “hit a wall” in marathons–even in races without hills. If you qualified for Boston, made it up that hill, and got to the final stretch, you had to be thrilled. Spectators would be clapping, yelling, and ringing bells. What a feeling of celebration for all. On the morning of this year’s Boston marathon, I posted the following quote on the Women Making Strides Facebook page: “If you are losing faith in human nature, go out and watch a marathon”. Watching a marathon is motivating and uplifting. It is a celebration of the human spirit, people going beyond their past limits. Marathon runners are wonderful role models with their “can do” attitudes, dedication to running, and discipline to achieve their goals. The spectators are also inspiring with their enthusiastic support for the runners. 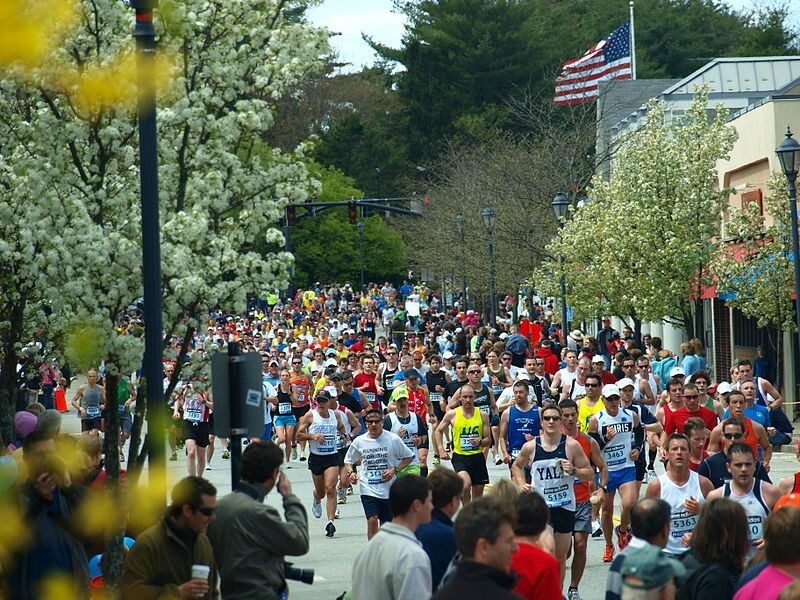 This year, many runners at the Boston Marathon were unable to complete the race. The joyous celebration came to an abrupt end. Runners and spectators faced death and destruction caused by two exploding bombs. In a setting that celebrates strong bodies with strong legs, several people lost their legs. An 8-year-old boy and two adults were killed, and many others were injured. One or more demented individuals caused mass destruction. We weep for the victims. For a moment, we pause and wonder if we should lose our faith in human nature. But let’s note that scores of medical personnel and volunteers came to the aid of the victims. Boston law enforcement officials stepped into action immediately. Runners and spectators stopped to help others even though they were afraid another bomb would go off. Throughout the world, people have prayed and posted supportive comments on social media. Today, runners wore race shirts and ran 4.09 miles because the first bomb went off at 4 hours, 9 minutes after the start of the marathon. Local running stores are organizing charity races in support of Boston. Marathon runners have said the horrific destruction that occurred will not stop them from running marathons again. Cities have said they will continue to hold marathon races. Let us honor the spirit of the Boston Marathon by working to improve our own “can do” attitude, our dedication to fitness, our discipline to achieve our goals, and our enthusiastic support of others. Then the spirit of the Boston Marathon will triumph and we will be able to look at what took place this year and still have reason for faith in human nature. This entry was posted in faith, Inspiration, positive-thinking, Running, Support and tagged faith, Inspiration, positive-thinking, running, Support. Bookmark the permalink. Well said, Sue. Very powerfully put, we can’t let them take us down or their evil will win. “Remember the helpers” is what Mr. Rogers used to say. When something bad happens there are always helpers making things better. And there were so many more helpers than evil doers in this situation. It was a horrible situation, but it gave scores of good-doers an opportunity to shine. We can honor the memory of those lost by continuing to do good. Great article!! Sue, thanks for sharing your wisdom. I know exactly what you are talking about with the fellowship of the marathon runners. I have completed two Marathon’s myself and it has been very hard seeing the tragedy some of those brave people suffered. It is heartwarming though to see all the heroes who were there to help those in need. I agree we need to concentrate on the good and not the evil, which is very difficult for those in the midst of their pain. Theresa, yes, the bombing was an evil act that caused pain. We must allow ourselves and others to grieve. Extremely well stated, Susan. I really enjoyed reading this. Wonderful article Susan! I ran my first (and possibly only) half-marathon 2 years ago when I was 56 years old. It was one of the hardest things I have ever done and I was so filled with emotion that I burst into tears when I crossed the finish line! I cannot imagine the horror in Boston, but I completely agree that we must support each other, continue to set goals and not let this evil bring us down. Instead of being cowed, I’m considering doing another half in support of the victims at the Marathon. There is more good in us than evil and we must never forget that. thank you for your inspiring words! That’s awesome, Leah. You’ve probably heard that at the London Marathon, runners plan to cross the finish line with their hands over their hearts to show respect for Boston. Excellent, Susan! I was never a Marathon runner. I left that to my younger brother. I was a sprinter. We can not allow evil individuals to dictate our way of life. We grieve, but we go on. We are in charge of our destiny, with God on our side. We are resilient, and determined as well. We fall, but get up quickly, and finish the race. Great post. Blessings. A very beautifully stated post, Susan. I can only imagine the depth of enthusiasm that’s usually found at marathons. While I have yet to have had the pleasure of being in one myself, but I hope to cross it off my bucket list one day soon. It was truly an unfortunate tragedy that happened in Boston, but you’re so right on point about this, the key is to keep the faith and believe that things will get better. But, we cannot also forget to do our part to, by being more of the changes we want to see in the world. My thoughts and heart go out to those in the Boston area. May God bless. Thank you for your comment, Deone. My readers can check out Deone’s blog at http://releasingmetoday.com. Well written, beautiful reflection. You just got yourself a new follower! Your article is well written and a thoughtful reflection about marathons. While reading the article it made me reflect on the recent triumph of my daughter and nephew who ran the Chicago Marathon last October. That was the first time I had attended this event. I was very touched by seeing the runners and spectators cheering any and all runners, including people from other coutries. I was choked up when I saw the handicapped runners giving it their all. And people were cheering the runners who were struggling to make it to the end. It is a beautiful event full of human emotions in the crowds. Yes, I have faith in human nature and for many more triumphs and celebrations at future marathons.